I’ve written a lot lately about multi-tasking and the blog post I wrote last week titled “How to Do It All and Stay Sane” has been one of the most popular I’ve ever written. It seems to have struck a chord with a lot of women and I’ve been overwhelmed with the comments, emails and positive feedback I’ve received. Yesterday I had meetings with clients about whom I’m writing for the June issue of Aspire. After that, I met a woman- now a friend- about whom I’d written previously. She and I hit it off immediately and we kept in touch after realising we had a lot in common. After reading the aforementioned post, she asked if we could meet for lunch and even though it was only the second time we’d met, we could have chatted all day. That is the lovely, lovely thing about my job(s). Meeting new people is something I always enjoy but making new friends is the best bonus I could wish for and the support that we, multi-tasking, hard-working, strong women, can give each other is remarkable. We talked about a lot of things including the feeling that it’s the small things that make a difference to managing busy lives. As we left, she complimented me on my handbag and compared it to her own capacious tote which she said was in need of organisation. I realised then that as I had gone from one meeting to another and then to lunch and beyond, I hadn’t once needed to rummage in my bag, and we all know how frustrating that is. This confirmed that yes, small things do make a big difference to the smooth- running of everyday life. This elegant bowling bag, the Liliana S by Maxwell Scott is absolutely ideal for business and pleasure. It’s medium size and the beautiful shine on the leather deems it perfect for day to evening use. Maxwell Scott is an English luxury brand founded in 2001 and is the epitome of luxury, style and ambition. It has a global market and is based in York, which is music to the ears of this Northern girl. The bags and accessories are handmade by artisans in Florence and the quality is second to none. Founder and designer William Scott Forshaw takes inspiration from British heritage to produce a chic, elegant collection of bags, travel bags and accessories for the discerning woman and man. The Liliana S, (S for small-there’s a larger travel bag version), has three internal zipped pockets, large enough for an iPad mini, and a phone holder. It comes with a long detachable strap for when one’s hands need to be free for cocktails and canapes, (or, perhaps more realistically in my case, coffee and a sandwich on the go). The red lining is both vibrant and hard wearing. My bag is night black leather but it is available in chestnut tan and dark brown too. 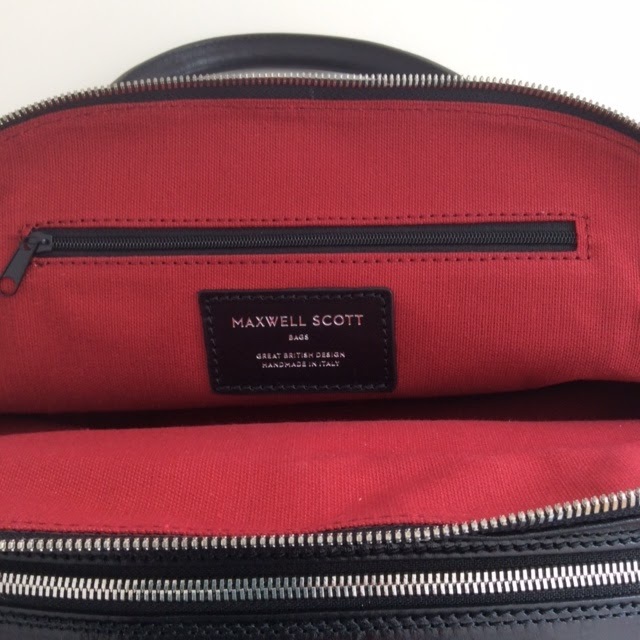 Maxwell Scott are very generously readers of my blog the chance to win one of their beautiful leather make-up bags. 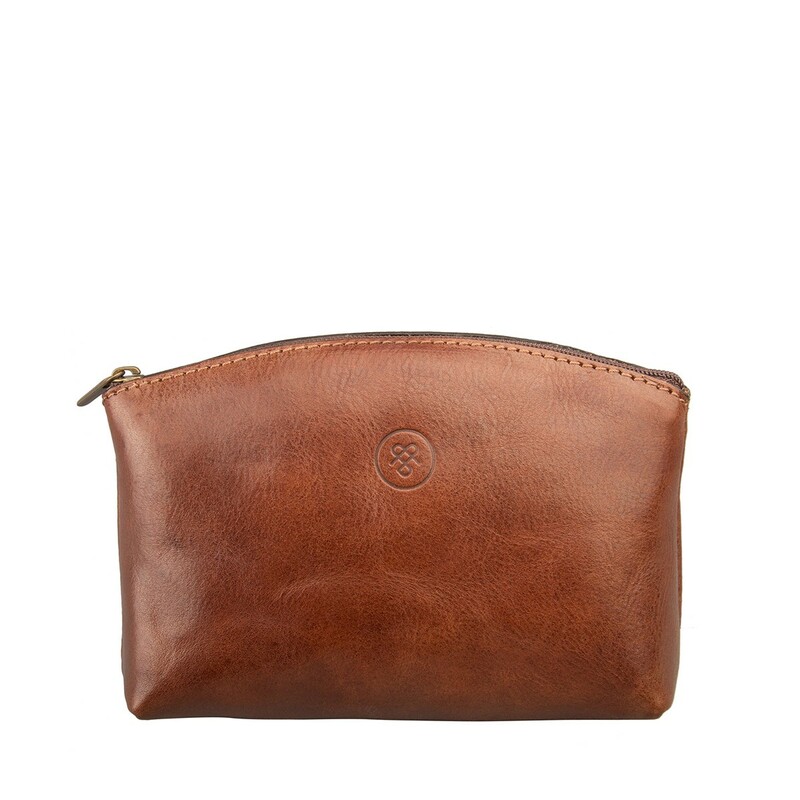 The Chia, in chestnut tan leather is as stylish as it is practical and comes in a signature Maxwell Scott gift box. Entry is via the link below. The giveaway is hosted by Maxwell Scott and the winner will be chosen at random by the Rafflecopter app, two weeks from now on Friday 29th April and the prize posted to the winner by Maxwell Scott. Although not mandatory, extra entries will be given to those that are already following, or start to follow me on Instagram and Twitter. For more inspiration and behind the scenes loveliness please follow me on Pinterest and don’t forget to sign up to my email so you never miss a post and to my newsletter for a monthly round-up plus extras and special offers at Lizzy O. Thank you Catherine and good luck! Yes, the quality is wonderful and I feel the same-that it will last forever. This leather makeup bag is AMAZING. Bag and shoes are ON POINT!!! The whole look is SO PRETTTTTYYYYYY!! Entered and followed your Insta + Twitter and may the odds be ever in my favor! I love my Maxwell Scott bag, it is an elegant Kelly style bag and the quality is really amazing!